At South Station, on the commuter rail platform, Keolis deployed its fare checkers. 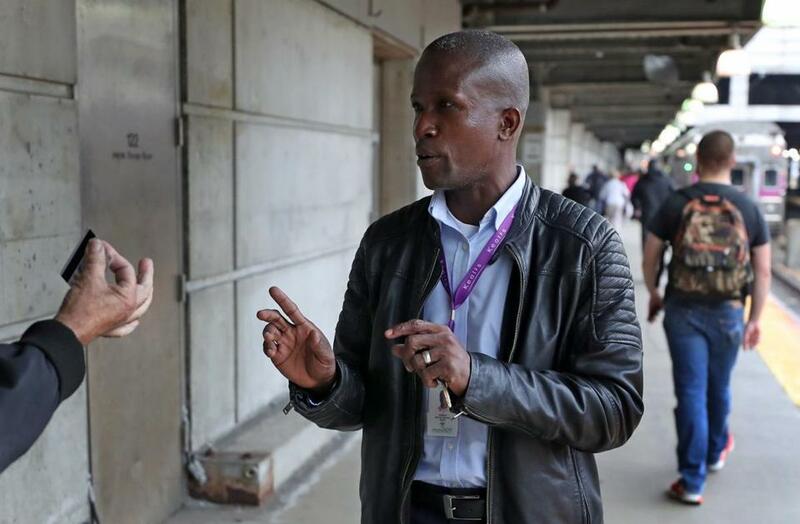 The Massachusetts Bay Transportation Authority has delayed a plan to install fare gates at commuter rail platforms that would have required riders to prove they paid for a ticket before boarding at North, South, and Back Bay stations. Officials had initially hoped the gates would be in place as early as this fall. But with the T updating its fare-payment system, the agency decided to hold off on installing gates for now and make it part of the comprehensive initiative to go to an all-electronic payment system across the entire MBTA. The T and its commuter rail contractor, Keolis Commuter Services, originally said they would install the fare gates first and then later remodel them to handle the new fare technology when it is installed in 2021. The gates would be similar to those used in the subway system. But in recent months, the T and Keolis decided it didn’t make much sense to have two separate projects that will reshape the way riders pay for their trips. “There’s a consensus that the sensible approach is that if we do fare gates, we will do it as part of the new fare collection system,” Transportation Secretary Stephanie Pollack said in an interview. Pollack added that there’s no final decision whether fare gates will ultimately be installed. The new fare system will be installed in stages over the coming years, with testing scheduled to begin in 2019. New equipment will be installed in 2020, and the old fare equipment will then be taken out of service the following year. The MBTA is holding meetings for the public to discuss various policies relating to the new system. The fare gates would help solve a longstanding problem that the T estimates costs millions of dollars a year; during rush hour, the train cars are often so crowded that conductors cannot check all passengers for tickets. Some riders had worried, however, that the gates would add a barrier that would cause backups on train platforms or even cause some commuters to miss their trains. Under the prior plan, Keolis would have paid to install the gates, in part from a revenue-sharing agreement that would allow Keolis to keep a portion of any additional fares. In the meantime, Keolis has deployed lower-tech ways to check fares before riders board, including having workers quickly check tickets on certain trains before riders enter the platform. This led to a surge in complaints from passengers, but Keolis says the complaints have diminished. The T’s new all-electronic fare system will be installed on the entire transit system, ending the use of cash payments collected on vehicles. The biggest changes, however, will be on the commuter rail. Riders cannot useelectronic CharlieCards to buy a commuter rail fare, whose prices are based on the length of the trip. Conductors instead either collect payment during the ride or visually inspect a pre-bought ticket or pass. Under the new system, riders will tap either the fare card, a smartphone, or a credit card to a fare reader as they enter and exit trains or stations to determine the cost of their trip.